This is a jazzed up version of some Cook’s Illustrated chocolate chip cookies. The last time I made them I thought they were good but needed something. Turns out that “something” was Lindt dark chocolate, salted cashews and a bit of Maldon sea salt. Interestingly, a few people around the web who have baked cookies using the original recipe reported them as thin. All the times I’ve made these cookies using the exact weights and measurements, they’ve come out on the thick side. Adding nuts makes them even thicker. The dough is really sturdy and can stand up to good chocolate that flows as it melts. The dough also has a pretty intense brown butter and brown sugar flavor. I like that in a cookie and enjoyed these quite a bit, but sometimes I wonder if we cookie bakers and bloggers should just step away from the browned butter for a while. Or not! I obviously have mixed feelings since I browned the butter for the cookies. 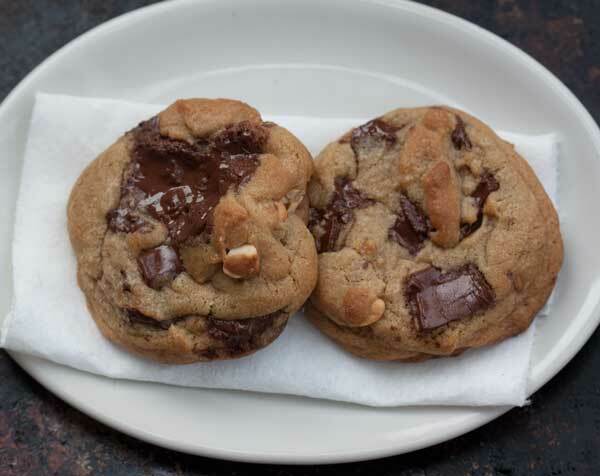 Chocolate Chunk Cashew Cookies are a variation on a Cook's Illustrated recipe made with browned butter, chunks of good dark chocolate and lightly salted cashews. In a small metal saucepan, melt 10 tablespoons of butter over medium heat, swirling often until butter starts to brown. Scrape into a mixing bowl. Add the remaining 4 tablespoons of butter and let cool to room temperature. Add the brown and granulated sugars, salt, and vanilla to butter and whisk until smooth. Let sit for 3 minutes, then whisk for 30 seconds. Repeat the process of resting for 3 minutes and whisking for 30 seconds twice. Using a silicone scraper or wooden spoon, stir the baking soda directly into the mixture until well blended, then add the flour and stir until fully blended. Stir in the chocolate chunks and cashews. Divide the the dough into 8 large sections and shape into tight balls. Pull each ball apart to make 16 rough mounds, then set the mounds "pulled-apart-area-up" on a foil lined plate or tray small enough to fit in the refrigerator. Chill the mounds for at least an hour or until they are very firm. If you chill them overnight, they'll bake up even thicker. Preheat oven to 375 degrees F. Line 2 large heavy duty baking sheets with parchment paper. Arrange 8 mounds of dough on one sheet and bake cookies for 10 to 14 minutes or until edges appear baked and centers appear set. Let cool on baking sheet for about 3 minutes, then carefully transfer to a wire rack and let cool completely. Sprinkle with a few flakes of sea salt if desired. I like to transfer my partially cooled cookies to the freezer for about 20 minutes to set the chocolate. I need to try these! I’m certainly not sick of browned butter cookies yet.